Allowing children to use their hands to create projects from natural materials can make for very rewarding learning experiences. 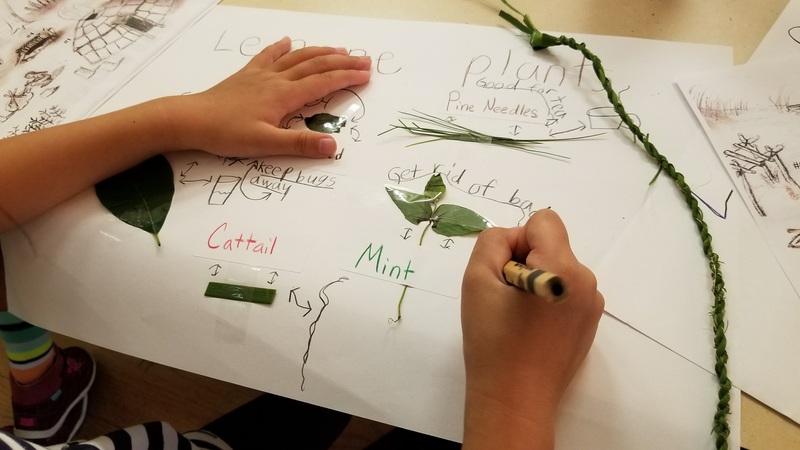 With limited amounts of time available for projects in today’s formal and non-formal classrooms the following crafts are my favorite for introductory activities related to Native American Life. Please comment and share your favorites in the comment section below. Clay Track Necklace: Make a ball of air dry clay slightly larger than a golf ball and press it flat into a disk. Next press an animal foot into the clay to leave an impression. Add a hole with a pencil for string to turn into a necklace or ornament. The track can also be used to represent your spirit animal. 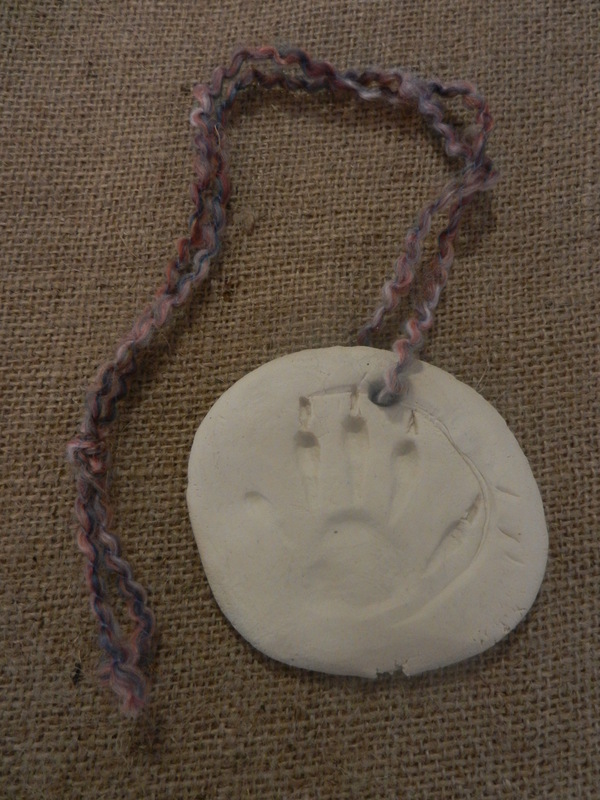 Or make Plaster Animal Tracks! Birch Bark Containers: Students use cardboard in the same way one would use bark to fold and sew a basket. If they excel with the cardboard they are given bark to try. Use a hole puncher to make holes on the sides and have children thread a string through and tie a single overhand knot. I’d recommend the saddle stitch if you have a small group but with 15 six and seven year old children and limited time it proved difficult. 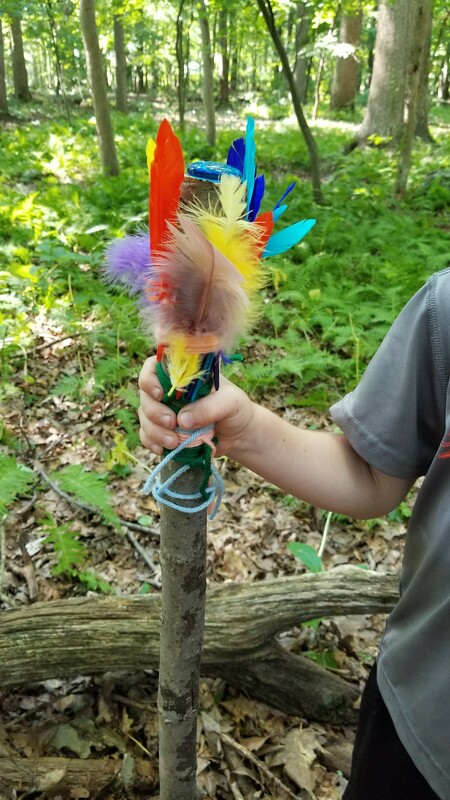 Walking Sticks: Let the children find a stick in the forest and decorate it with string, feathers and other bits and pieces you may have available. Bring a hand saw or loppers to cut a few pieces to share. 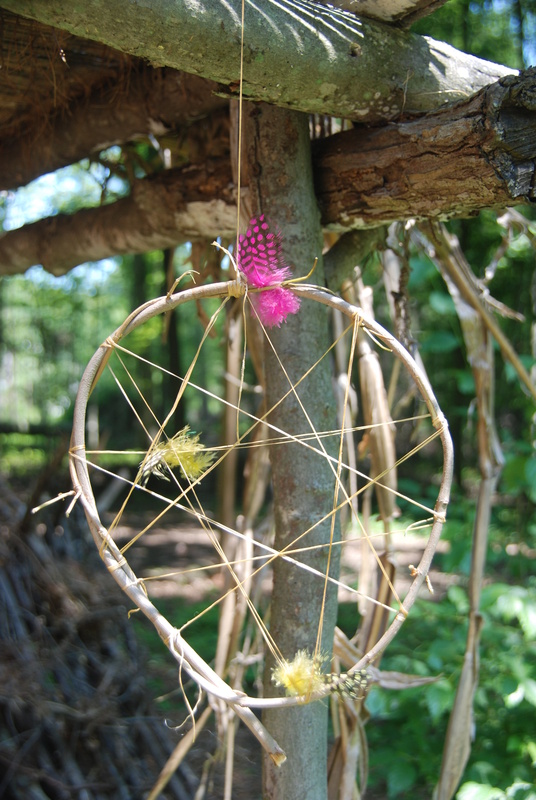 Dream Catcher: Cut a piece of willow, dogwood or other flexible branch to create a circle within which you can create your dream catcher. Instruct students to tie a piece of string or artificial sinew to the side and begin to tie it across adding beads or feathers as they like while attempting to stay out of the middle to create an eye. Native Americans of the Great Plains believed the air filled with both good and bad dreams. According to legend, the good dreams pass through the center hole to the sleeping person and the bad dreams are trapped in the web, where they perish in the light of dawn. Corn Cob Darts: Simply add a feather into the back of a corncob. Can be used for stalking games or to demonstrate how children develop skills and coordination in play that may be necessary skills for adults to acquire food. The corn cob dart is like that of a spear or throwing stick used in hunting. Dyeing Bracelets: Make reverse wrap cord or braid cotton string into a bracelet. 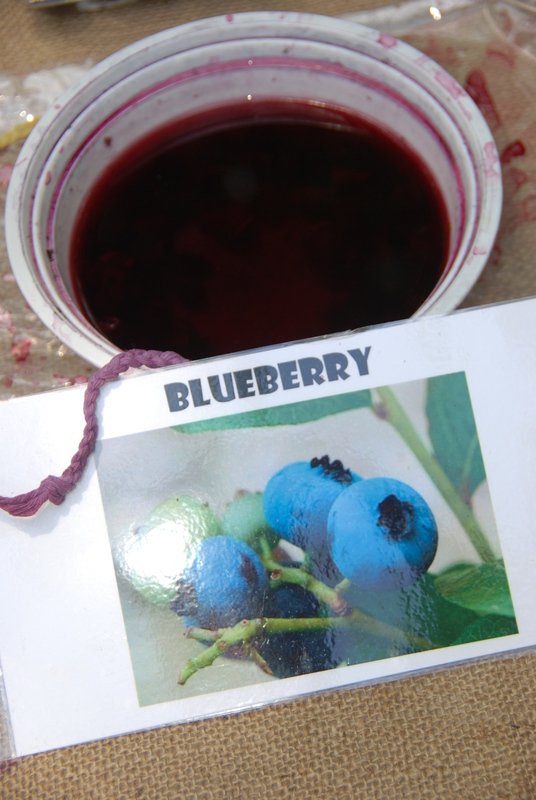 Place the string into a dye bath from boiled blueberries or other natural dye of your choice. Add salt and vinegar as a mordant to fix the dye and let dry in the sunshine. 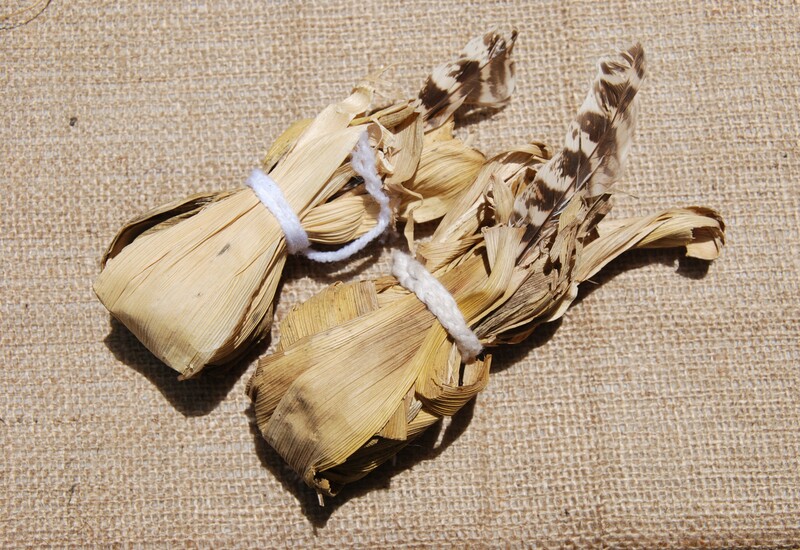 Pokean: Wrap corn husk around a pebble and tie tight. Add a feather for decoration. Tap the poekan in the air like a hackysac but use both feet and hands. 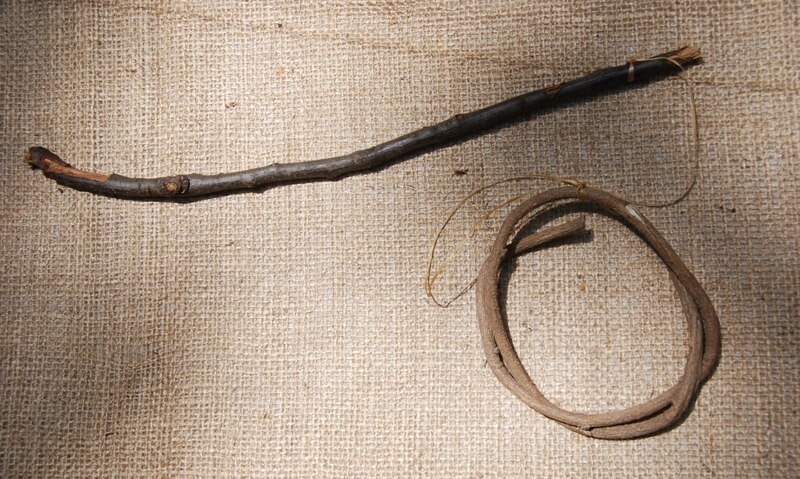 Ring and Pin: Find a stiff stick about 12″ long and a flexible branch from a willow or dogwood that can be bent into a circle. 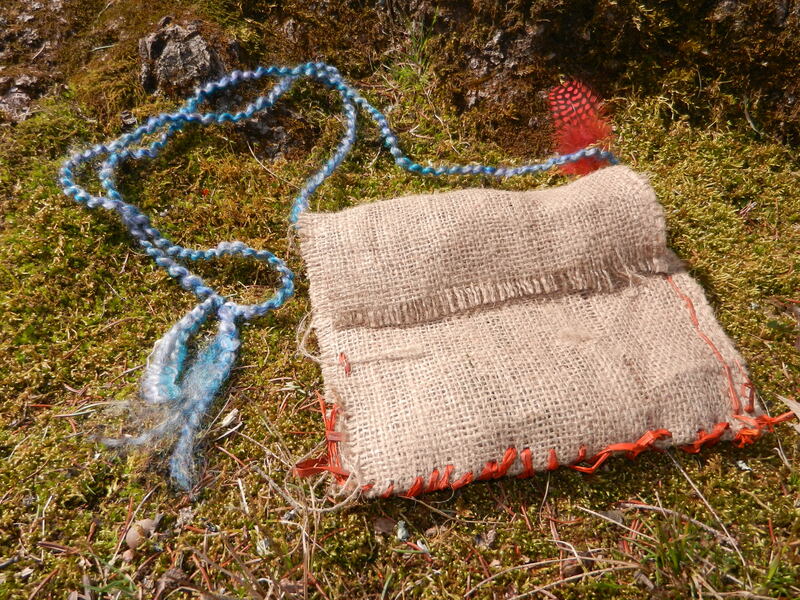 Tie the two together with some cord, sinew, yarn, raffia, jute or whatever you choose. Try and flip the circle onto the stick. This game is sometimes referred to as “spear the deer”. The player who takes the least amount of tries to put the stick through the hoop wins. Clay Pots: Using air dry clay or naturally harvested clay children create pinch and/or coil pots. 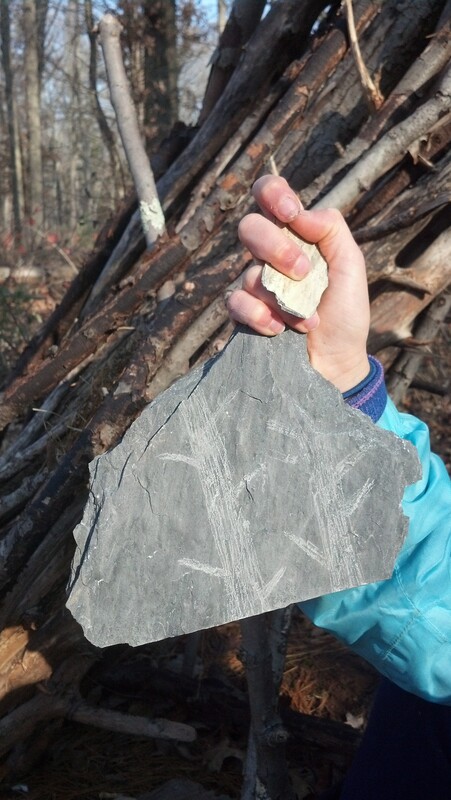 Arrowheads can be used to soften or draw designs on the sides. Making clay pots in Lenape Camp at Essex County Environmental Center. Planting a Three Sisters Garden: According to legend, corn, beans and squash are three sisters who only grow and thrive together. Corn provides a natural pole for the beans vines to climb; the beans help stabilize the corn plants; and squash vines help prevent the soil from drying out. 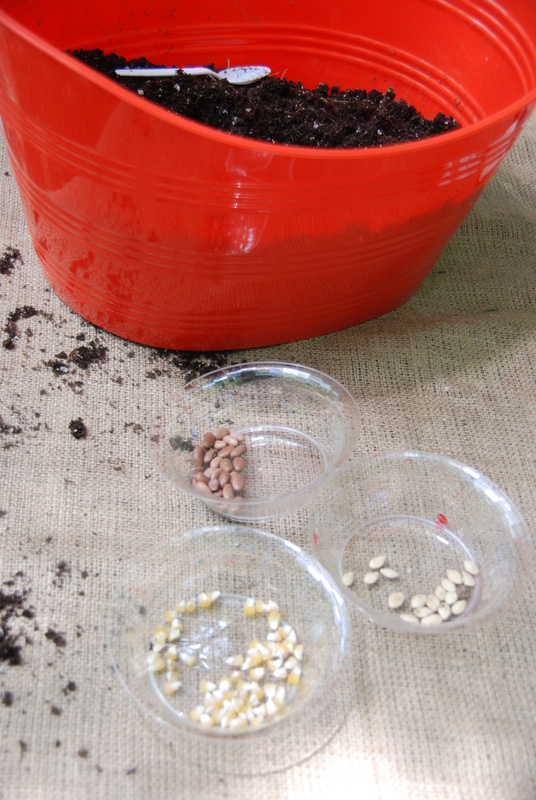 Mix the three seeds in a healthy soil mix and add to a pot to a large pot to take home. 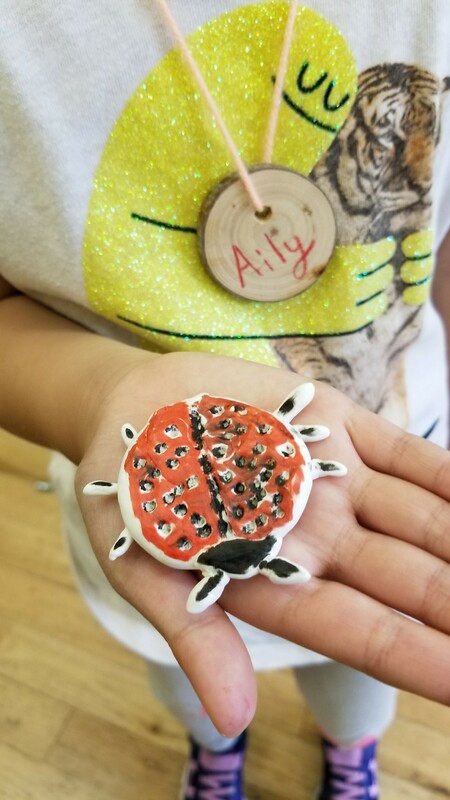 Critter Totems or Spirit Animals: As a get to know you activity I like to ask the kids early on what there spirit animal is and why. They will draw the animal on their name tag necklace made of a tree slice aka tree cookie. We’ll give them a piece of clay and ask them to create a little example. The below examples were made with white model magic and markers. Make Canvas Moccasins: You can use canvas cloth for the first pair and instruct students to use leather once they are experienced in the design. You can purchase leather from a craft supply store or buy an old pair of leather pants from the second hand store and cut them up to be re-purposed. See Moccasin Post for Instructions. Corn Cob Dolls: Make your own primitive barbie with husks from a corn cob. Take six pieces and fold them in half. 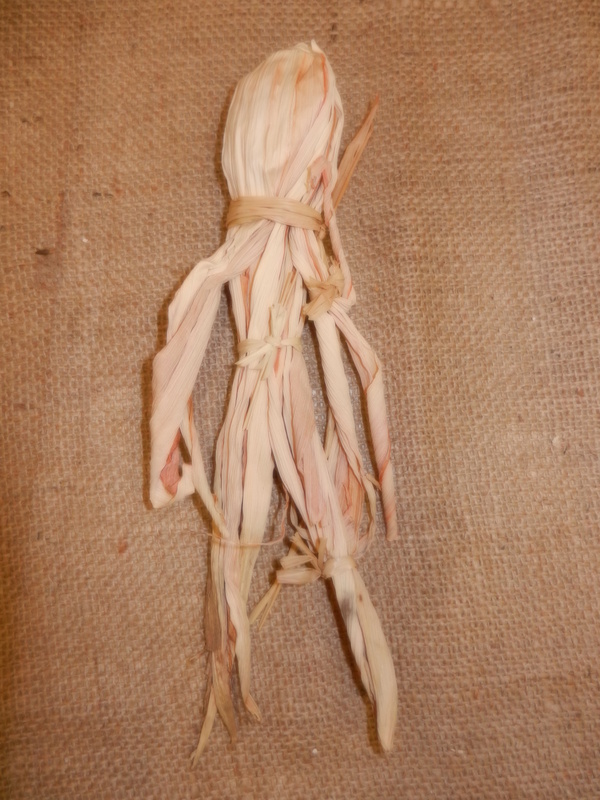 Tie a piece of raffia or thin piece of corn cob two inches down from the to to make a head. Separate out the pieces on the right and left for the arms and tie them at the wrist. Tie another piece around the waist and one on each leg at the knee cap. 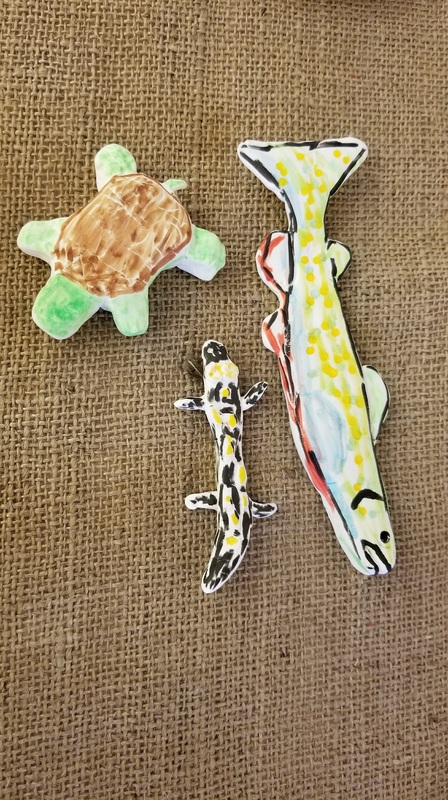 Magnetic Fishing: Purchase pre-cut fish shapes from a craft store and have your students paint them as they wish or paint them to match a native fish in your area. Glue on a magnet to make a magnetic fishing game. I taped another magnet to the end of a fishing string to create just enough pull to make a steady hand necessary. This works great as a free-play kinda activity station and prepares children for the real thing. 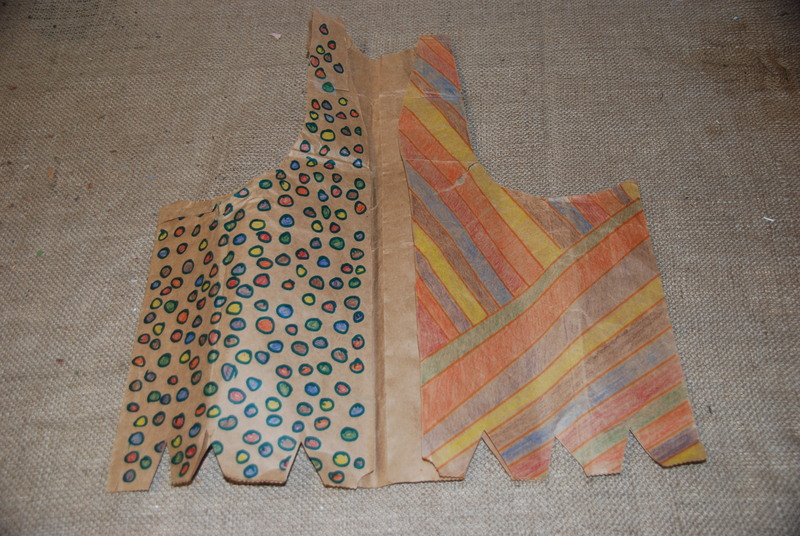 Paper Bag Vests: You can reuse your paper bags from the grocery store to create vests for early learners. The children can be prompted to decorate their vest according to a clan they are assigned (Lenape: wolf, turtle, turkey) or they could camouflage the vest with leaves, clay and natural dye pigments. 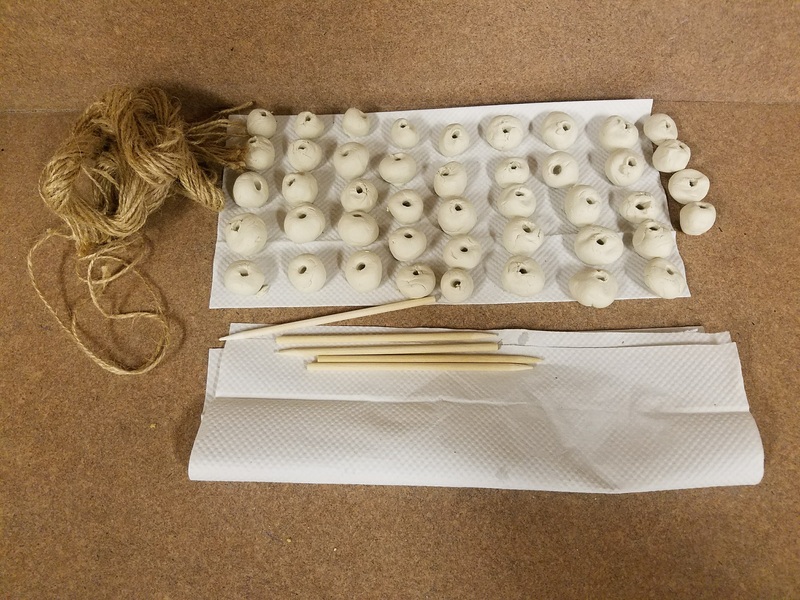 Clay bead necklace: Roll small balls of air-dry clay and push a pencil through to make a hole. Let them dry. Painting with tempera crayons seems to work well for a make and take project. Charcoal Art: Use burnt sticks from a fire or make your own charcoal sticks to draw animals or scenes of nature. 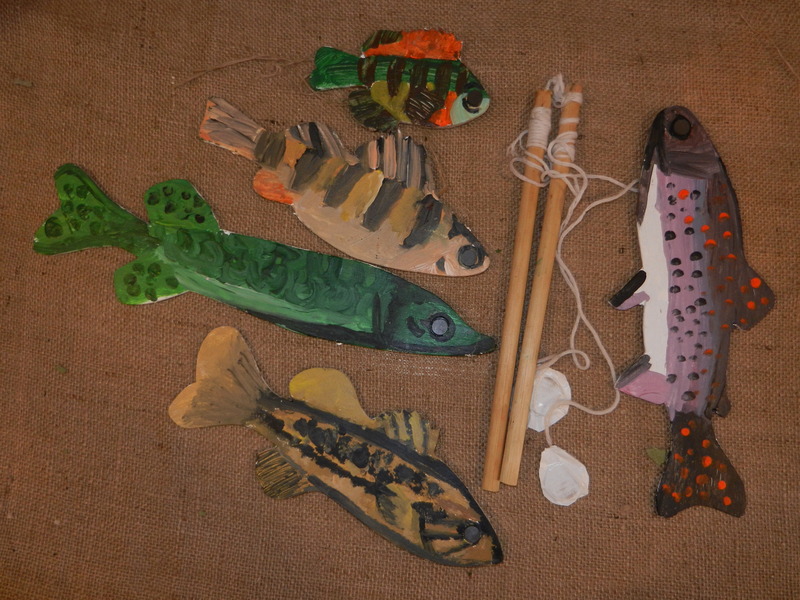 Can be done on a piece of slate or paper bag cut like an animal hide or a simple piece of paper. Or simply draw on slate!